Lots of people often ask me where is the "most beautiful place" in the world? Even this past few days I was asked that question and having been to a few places my answer is quoted from Dorothy in the "Wizard of Oz"..."There is no place like home"... Hanging out with your family and friends in a place so common yet can be so unfamiliar to makes life's journey so memorable. 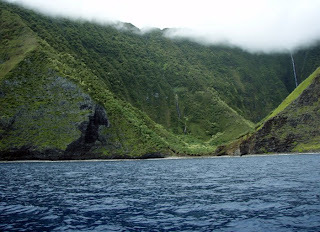 On this side of Hawaii, Molokai still retains much of the Hawaiian culture and True Aloha spirit is alive and well. These past few days we lived as the Hawaiians did 100 years ago. We ate what we caught, we cooked and cleaned with the water from the river, there was no air conditioning in this humid weather but open doors and windows. We shared stories, made new friends, and rekindled old friendships with those on Eastside Molokai. The beauty of the their landscape with steep vertical cliffs, lush vegetation, and huge waterfalls, makes for a trip of a lifetime. It's good to travel and see the world but it's even better to be content in your own back yard. Molokai No Ka Oi! What a memorial day 2009! Last night I had vivid dreams of 3 pronging blue uhus on the street so I couldn't sleep. At the last minute we decide to load up and beat the sandbar crowd down at the pier. We were one the first so the coast guard decides to inspect our boat and we pass with no problems...Whew! Kris Tyler decides to close shop and Travis Masutani has been enjoying the life of a free man or free diver or free surfer whatever you call it but he wanted to test out his new 120 cm. Riffe Eurogun. Not even 5 minutes in the water we spot a solo ono coming in to investigate. 1 minute later, I pull my trigger and 5 minutes later he was on the boat. Travis then spots another two onos making their pass and as it begins to swim away he puts on the trottle and chases after it. Kris and I watch as he takes a far shot and penetrates the back third of the fish. It runs hard but after we put the second shot in the fish was done. Travis was stoked as it was his first ono. We take a water break and back we go looking for more. We were on our last pieces of chum and about to give up when the ono pile decides to pass by. I peer over to Kris to see if he see it and he is already lining up on one. We simultaneously pull our triggers and Ka-boom the basookas go off with success! Another lucky-day in the making as we head back in to beat the crowd for a memorial day to remember. What can I say, but another beautiful day in Hawaii Nei...Seems like it's been the same for the past month already but who cares no one is complaining. Kris Tyler from Westside Dive and Tackle called me to go dive so we headed out to one of my Eastside spots to target some Opelu Kala. The water was so glassy we could have drove to Ni'ihau. Got a few in the cooler and moved to another spot that holds onos. The next thing I see Kris dive bombing on this passing ono. It veers off so I toss my flasher and it see it! Keeping right on top on the descending flasher I follow it down to about 40 ft. then as the ono comes in range, BAM!%*# right in the kisser! Not a stone shot, Kris signals to second shot it so I say ok, just to make sure we land it. As he descends down, lining up on the fish he is just about to pull the trigger when I see a second ono coming in to investigate. From the surface, I start yelling through my snorkel and like a dentist understanding his gargling patient, Kris looks up at me from below. I point to the oncoming fish and he does a 180 turn and takes the shot! KA-BOOM@*@! Yeah, I yell! Our boat crew, Alan and Cat also start cheering and the rest was history! How's this Hawaiian weather we've been having? Light winds all week with swells on all shores and happy people waiting anxiously for the memorial day weekend to arrive. Been busy fixing up the Red Sea Boat for another adventure. Found a couple of areas in need of repair so I busted out my ding repair kit and started construction. 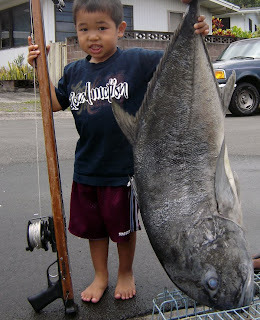 My nephew Maika had other plans, so while uncle was working on the boat he was busy catching fish for dinner. It's always nice to catch fish that weighs more than you! Do you know what a "magic board" is? It's that perfect board that rides well no matter what the conditions. I've been riding this 5'-9" since 1993 that has traveled the world. Today Jason Kashiwai shaped me a duplicate to my "magic board" that I'm excited to test out. Jason has some of the best boards in town but now he is in Waipahu so check him out for your next order. 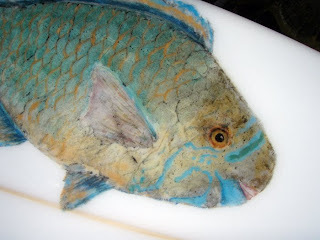 We laminated "gyotaku" fishprints by Crow which looks hot! This Uhu was speared by my good friend Keith Yamane and the detailed coloring done is awesome! We have almost every type of edible fish available for gyotaku laminates in any size so let me know if you want one for your next "magic board". 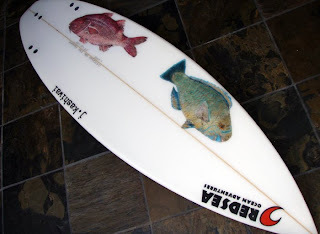 Hopefully we will see some flying fish on my next surf session. Hope the sharks don't try and eat my fish! What a beautiful day in Hawaii nei! I love kona winds just a much as any diver or surfer (depending where you go). We woke up 4 am. packed up the Red Sea Boat and off we went to the wild blue yonder! The water started getting rough and our tiny ship was tossed, but if it wasn't for our faithful crew our minnow would be lost? Sounds familiar? 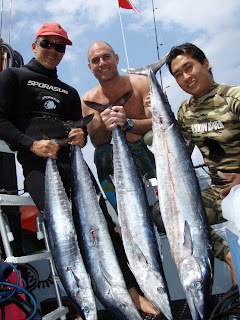 So we pounded through the surf and got to our remote destination on the west side where got some reef fish for dinner. This 12 lb omilu was hiding in a cave when I called Kirby over to shoot it. I swam through the front door of the cave and as the fish was making a escape through the back door, Kirby had to pull his gun back and shoot from the hip. Of course McGyver James Oshiro was onboard to witness the catch.